Tuning Dongle for electric bicyc..
Tuning Dongle for electric bicycles with Bosch Classic Line engines (from the year of 2011 up to 2014). The Sx2 Dongle removes the 25 km/h speed limitation and shifts the engine support from 25 km/h to 50 km/h. Very easy installation: Plug and drive! All Bosch engine assistance levels are retained. No changes in the engine electronics. The device needs no separate battery. Robust and outdoor suitable design with encapsulated electronics. Cancel the tuning whenever you want: Simply remove the Dongle and you can drive legally on public roads again (legal in a few seconds). The Sx2 Dongle is theft-proof due to its pluggable design. Produced by the German company Maintronic. The Sx2 Dongle provides an easy way to double the motor assistance from 25 km/h to 50 km/h! 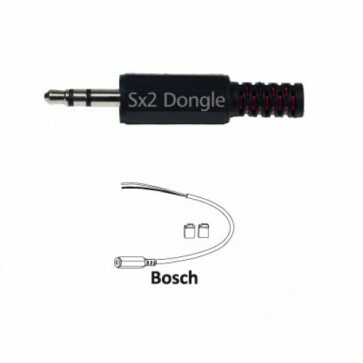 Use the Sx2 Tuning-Dongle and the support of your Bosch Classic Line engine doubles to 50 km/h. All Bosch assistance levels will be kept, because the device activates itself automatically between 13 and 25 km/h. The devices does not cause any changes in the electronics of your Bosch motor. Undo the Tuning whenever you want. It is not allowed to use electric bicycle tuning tools on public roads. But due to the pluggable design of the Sx2 Dongle you can cancel the tuning at any time. Simply pull off the Dongle and you can drive your bike legally on public roads again. The Sx2 Tuning-Dongle is robust, waterproof encapsulated and needs no extra battery. Furthermore, it is permanent maintenance free. The Sx2 Dongle has a pluggable design: If you park your electric bike somewhere, simply pull off the Dongle and take it with you. We would like to point out that the use of tuning tools like the Sx2 Dongle is not allowed on public roads, because these devices manipulate the speed of your electric bike. You may only use devices like the Sx2 Tuning Dongle on private, enclosed areas or on designated routes. No liability is assumed for any current or future damages to persons and / or objects caused by the improper use / installation / deinstallation of the Sx2 Dongle. Use the Sx2 Dongle at your own risk. The manufacturer´s warranty of your electric bicycle may be limited or totally expire if you use tuning tools like the Sx2 Dongle. Please drive carefully, use security clothing and a bicycle helmet.